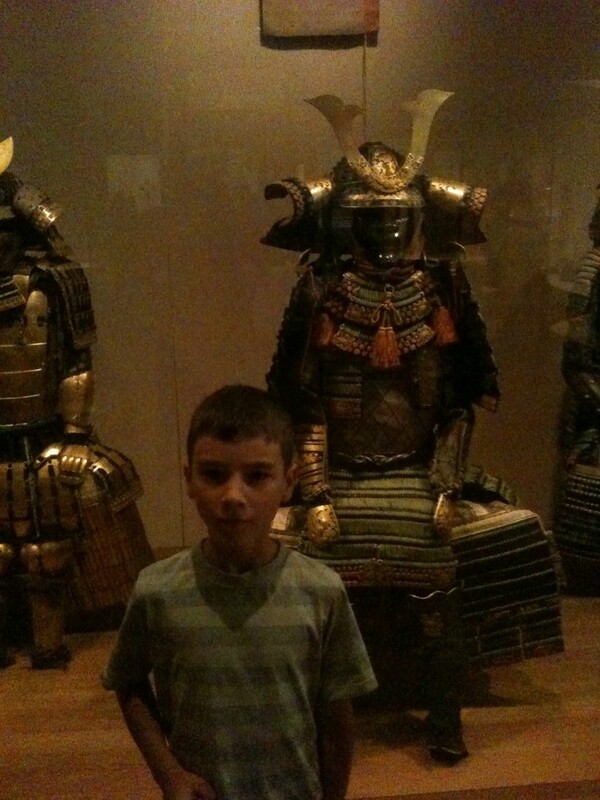 Declan with Samurai armour - another obsession thanks to a series of books. 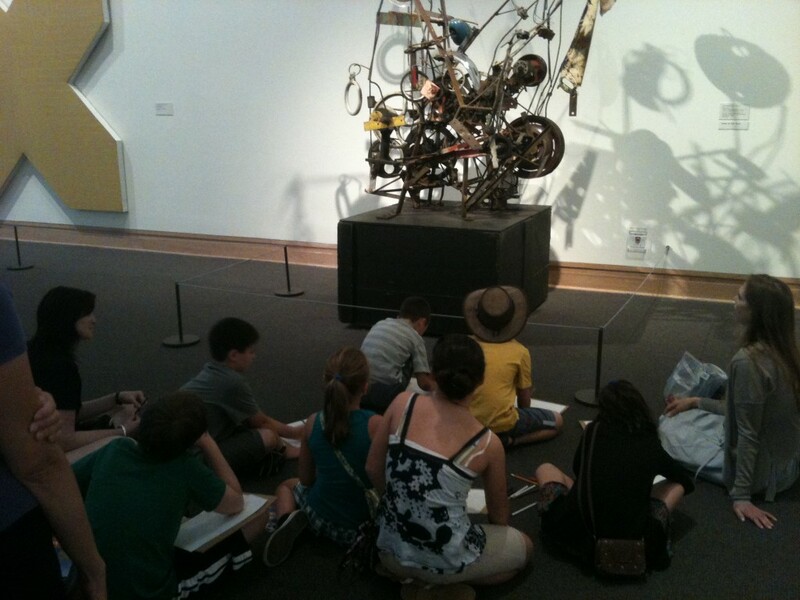 Children's activity at The Met. You could spend all day in the Metropolitan Museum of Art; and we almost did. The Met has leapt to the upper reaches of our list of favourite museums: It’s a beautiful airy building with the items perfectly displayed, and the works themselves are just amazing. Walking through the Met is like walking through an encyclopaedia of culture. There may not be a million examples of everything, but they’ve picked the eyes out of the world’s great artistic works. The Met is also wonderfully well-organised. We downloaded a great tour which used the Percy Jackson books as a theme to take the kids through a treasure hunt of Greek art. Declan has become a walking expert on Greek gods since devouring the Percy Jackson books. So he had an absolute ball running about, finding items and explaining them. We also did a children’s activity organised by the museum. It took us into a contemporary art section we otherwise would have glossed over and got the kids really thinking about what they were seeing. Excellently presented and perfectly pitched. So from high culture to a bit lower, we walked down to FAO Schwartz, New York’s premier toy store and another place that does a great job presenting its items of interest. 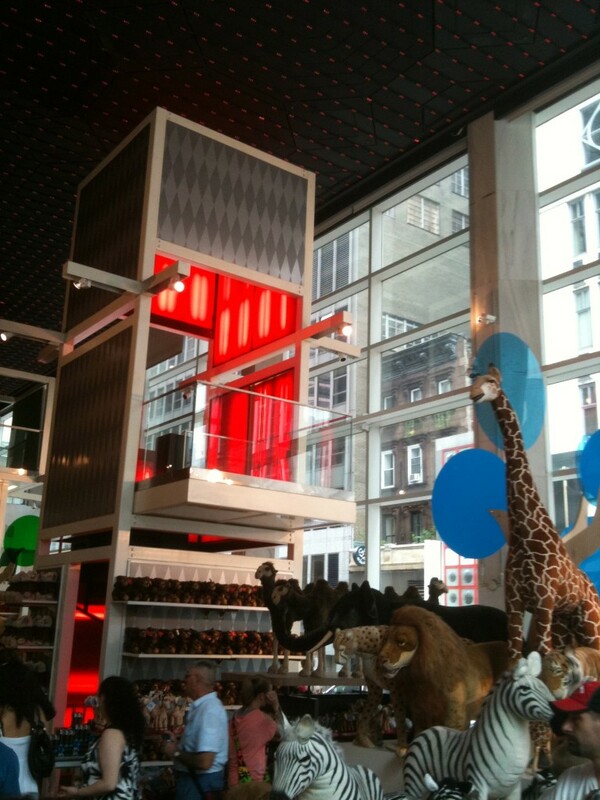 The boys ran round like exactly what they were – kids in a toy store. You’d have thought their cheeks would begin to hurt from holding massive grins in place for so long. They both ended up buying some Lego, Callum with a portion of his Granny Birthday money. Changing pace again we stopped at GAP so I could replace my t-shirts, which after eight months of constant use are beyond their last legs. Jennifer’s humour highlight of the day was the fact I replaced the old ones with identical new ones (she failed to notice that there are two blue ones this time!). 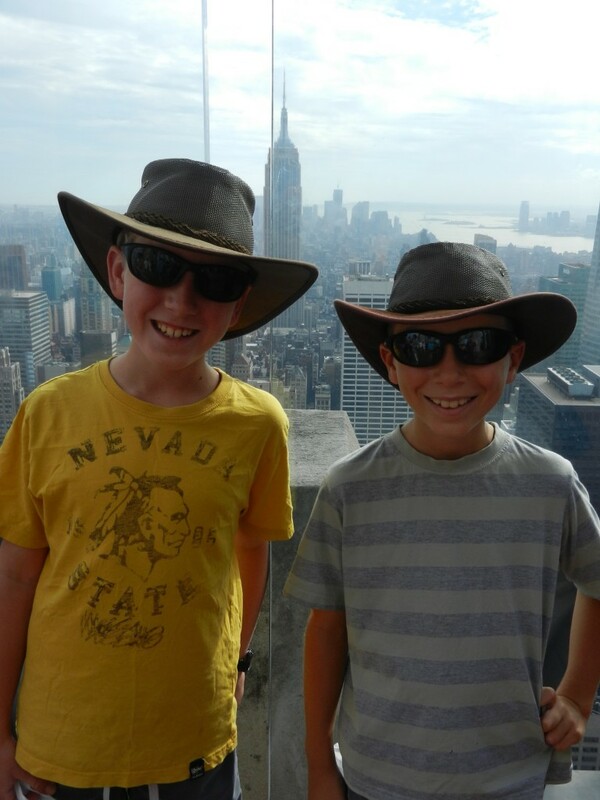 Then on to the Rockefeller Centre and the Top of the Rock viewing platform for a fantastic view over the Manhattan skyline and out into the surrounding townships. It was almost worth going up just for the ride in the glass-ceilinged elevator – an experience which was remarkably similar to the special effect when a spaceship takes of in a buck Rogers movie. Finally we tried to make our way home on the subway. We got on the subway at 47th Street and whizzed North. We passed our stop at 81st Street at speed and kept on going and going. Eventually the train halted at 125th Street. So back on a train we get, this one going downtown. Once again we zoom past our desired stop. This time we ended up at 52nd Street. We then narrowly avoided going back up to 125th, jumping off a train at the last moment. Finally we got the right train and made our exhausted way home. We’re a long way short of impressed with the NY subway system. Hot, noisy and with lousy signage – many platforms don’t even have a map, let alone an electronic board saying where the next train is going. Buying a pizza was all we could face in the way of cooking dinner, and anyway pizza is an American experience. We were amused at the contrast with our last pizza. In Iceland they come in 10-, 12- and 14-inch sizes. Here the choice was 16- and 20-inch. A big pizza in the Big Apple. I loved this post… it brought back so many great memories of our NYC trip this time last year…MET followed by FAO Schwartz; an excellent choice. If there’s one thing the Yanks do well it’s museums and toy shops. I only wish they could apply the same enthusiasm to their subway. Taxis are cheap, though. As for other forms of transport I can highly recommend hiring bikes from somewhere near the end of W73rd down near the water… great way to see the river and other areas of town and take in a spot of people watching.